Written in an accessible and easy-to-read style, this cutting-edge book presents advanced solutions to current and future telecommunications optimization problems. The field of telecommunications is growing and changing ever more rapidly, presenting new real-world problems for optimization researchers to address. Telecommunications engineers tend to know all about the problems involved but are often not aware of developments in computer science and artificial intelligence that might solve those problems. This unique book takes a colloborative approach describing the essence of the problems and then the heuristic and adaptive techniques which are now recognised as adept at solving these problems. In addition the emerging technologies in telecommunications and increasing use of the Internet expand the role that advanced heuristic and adaptive methods can play. This state-of-the-art book will be an essential resource for optimization researchers needing a wider appreciation of the problems in telecommunications, and indispensable for telecommunications engineers using heuristic and adaptive techniques. David W. Corne holds a Chair in Computer Science at Heriot-Watt University, Edinburgh, Scotland, and his research interests include evolutionary computation, multi-objective optimization, bioinformatics, telecommunications, and general aspects and applications of nature-inspired computation. Martin J. Oates is the editor of Telecommunications Optimization: Heuristic and Adaptive Techniques, published by Wiley. 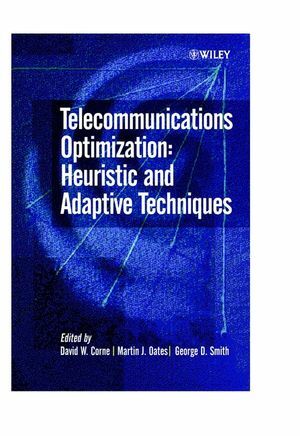 George D. Smith is the editor of Telecommunications Optimization: Heuristic and Adaptive Techniques, published by Wiley. Heuristic and Adaptive Techniques in Telecommunications: An Introduction. Evolutionary Methods for the Design of Reliable Networks. Efficient Network Design using Heuristic and Genetic Algorithms. Tabu Search and Evolutionary Scatter Search for 'Tree-Star' Network Problems, with Applications to Leased Line Network Design. Addressing Optimization Issues in Network Planning with Evolutionary Computation. Node-Pair Encoding Genetic Programming for Optical Mesh Network Topology Design. Routing Control in Packet Switched Networks using Soft Computing Techniques. The Genetic Adaptive Routing Algorithm. Optimization of Restoration and Routing Strategies. GA-based Verification of Network Protocols Performance. Neural Networks for the Optimization of Runtime Adaptable Communication Protocols. SOFTWARE, STRATEGY AND TRAFFIC MANAGEMENT. Adaptive Demand-based Heuristics for Traffic Reduction in Distributed Information Systems. Exploring Evolutionary Approaches to Distributed Database Management. The Automation of Software Validation using Evolutionary Computation. Evolutionary Game Theory Applied to Service Selection and Network Ecologies. Intelligent Flow Control Under Game Theoretic Framework. Global Search Techiques for problems in Mobile Communications. An Effective Genetic Algorithm for Fixed Channel Assignment.